The fort of Arnala is built on the northeast of a small island Arnala. 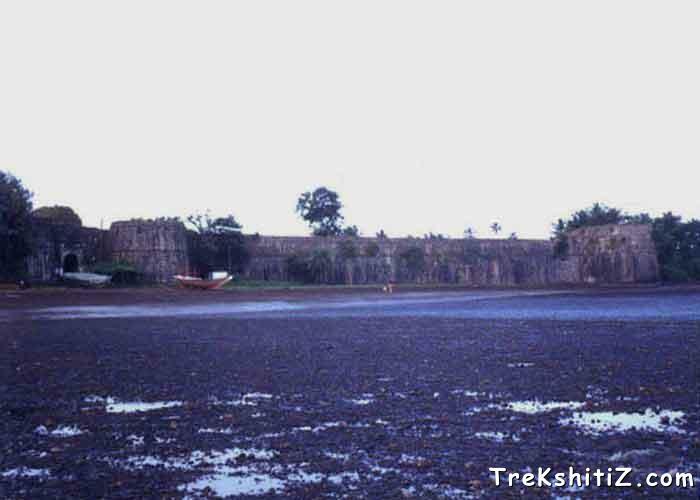 As river Vaitarna of North-Konkan meets the sea near this fort it is possible to keep watch on this creek and the surrounding area. Sultan Mahmood Begda of Gujarat built the sea fort of Arnala in 1516. In 1530 Portuguese won this fort and built new structures on it. Portuguese ruled over the fort for more than 200 years. Later the Marathas took it. Bajirao-I reconstructed fort like the Portuguese. In 1817, like the other forts, British captured this fort also. The fort is approximately rectangular in shape and is being protected by continuous and strong ramparts having a height of about 10 meters. The bastions are in good condition even today. There are three entrances to the fort out of which the main entrance is on the north side. At both sides of this entrance there are two big bastions. On the arc of this entrance nice carvings can be seen and on both sides an elephant and a tiger are carved. These indicate the strength of the ruler of the fort. On the main entrance a lithograph is seen. From the lines of the lithograph we can understand Bajirao Peshwa reconstructed that fort. Inside a fort there are temples of �Tryambakeshwar� and �Bhavani Mata�. In front of �Tryambakeshwar Mahadev� temple is a nicely built octagonal lake. Inside the fort, wells of drinking water are available. On the way towards main entrance, there is a temple of �Kalikamata�. If we see the fort from the beach we see a bastion to the left, which is apart from the fort. There is a small entrance to enter it. It takes about half an hour to 45 minutes to see the fort completely. We can view the surroundings while walking on the strong rampart of a fort. From the projection above the main entrance we can see the fort completely. Arnala is about 10 km from Virar station on western railway route. S.T. buses and auto-rickshaws are available to reach there. After reaching the beach from Arnala village we can reach fort by commuter boat only. The boat service is available from 6 a.m. to 12:30 p.m. and from 4 p.m. to 7 p.m. It takes about 5 to 10 minutes to reach fort through the boat. Not available on fort. A day is sufficient as one can see the fort completely and return by boat within 2-3 hours. Water is available in the wells on fort.